68th recipient – If you don’t believe in God then he is just stone. Rajesh is from Gorakhpur, UP. He arrived in Mumbai around 10 years ago. I asked him what made him come to Mumbai? He replied, ‘I came here since we did not have food to eat back in the village.’ His eyes turned moist when he said that to me. Then he put his head down for a moment, and looked at the floor. I felt he was staring at a Grand Canyon between him and us, even though he was seated at just an arm’s length from me! His reaction to my question about why he came to Mumbai made me realize what prolonged hunger can do to you; I think the violent spasms of an empty stomach from a distant past can return to haunt you, even at the slightest unintended-provocation! His own family consists of his wife, three sons and one daughter, the eldest is 14. They go to school. His parents died when he was very young, because of TB, and he (and his two brothers) were thereafter brought up by his Mother’s sister and her husband as they had no child of their own. His brothers work in the village as carpenters. He said, ‘After our parents died, we were looked after by my relatives, and I took charge of my responsibilities as a man, and a family man, only after my first child was born. Until then I was a dependant on my foster parents.’ Even his foster parents have passed away. As for his own parents, he does not have any memories of his father, except that he was a watch maker, a watch repairer. I asked Rajesh to describe God. The used bicycle we donated to him will be of use to him to travel to some of his work sites, so he will now save money on expensive public transport. He will also use it to fetch vegetables for their own consumption. Most importantly, the bicycle will be used to fetch portable water for their household use. The portable water he buys, costs Rs 3 a can, and the can weighs 20 Kgs. Until now he fetches the same on his shoulder and back from a source that is 2 Kms away. Hereafter, this bike will share the load with him. When Rajesh told me his family of 5 people sustain themselves daily on only ONE can of 20 Kgs of portable water, it immediately put into perspective how much ‘portable’ water I may be employing to wash my bike once a week, and my car daily! I am certain that everyday my employee (the fellow who washes my car daily) must be using at least one can of 20 Kgs of portable water on my car, or one on my bike weekly! 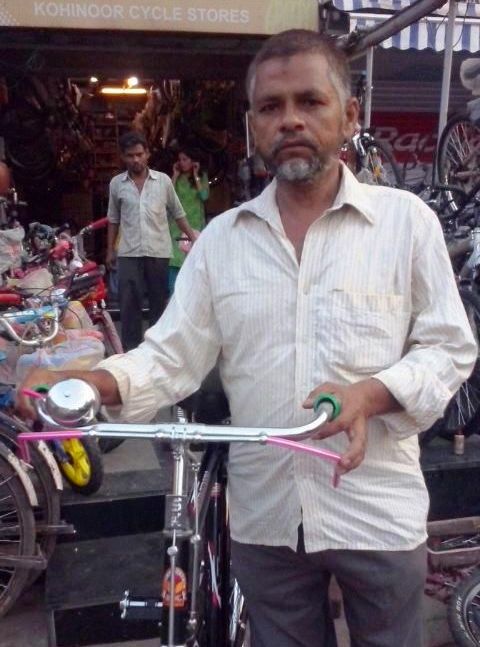 67th recipient – our bicycles are like parents. Okay Bro!!! So I braced myself for his aggression. But then, just for a second, I felt I should simply walk away from this seemingly-rude fellow. However, I thought, my random question to a random stranger can certainly come across suspicious; Did he misunderstand that I suspected whether his bike is a stolen one!? ; furthermore, it’s probably a question no one has ever asked him, because that’s what many earlier recipients had told me; moreover, it’s certainly not written on my bloody face ya, what Bicycle Angels is all about! So, I stayed put and explained to him with patience who we (Bicycle Angels) really are. 66th recipient of livelihood bicycle. 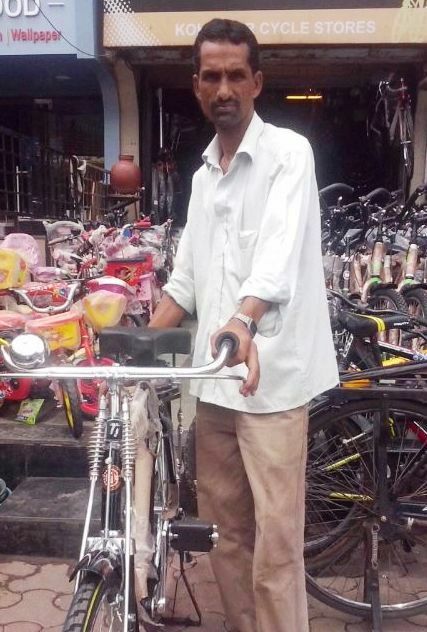 Rakesh Kumar was given a new bicycle by Anuraadha Tiwari in January 2014. He was the 26th recipient of our help. He called me up early in the morning the next day, and began to cry on the loss of his new cycle. He wondered how he will go about doing his work as it’s dependant on a bicycle, and he cannot afford to buy one. I knpw a second hand bike in very good condition will cost about Rs 2500; So after I heard him out, I told him I have a second hand bike, and asked him if he would be willing to pay a donation of Rs 1000 for the same? 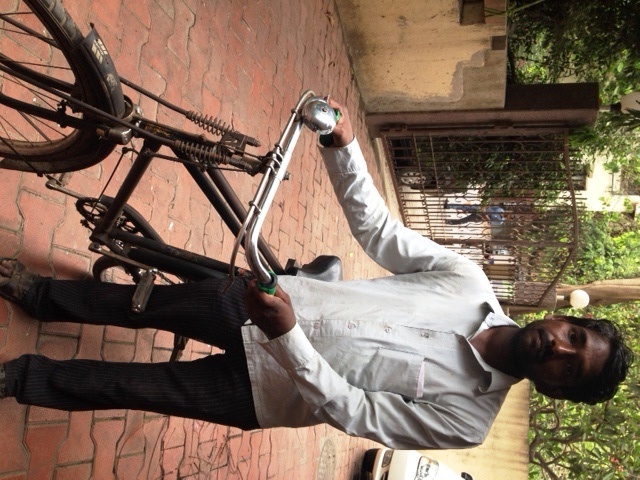 Rakesh agreed, as a second hand bike would anyways cost him anywhere between Rs 600 to 2500, depending on its condition. So we gave him the bicycle that was given to us by the Bread seller Naimuddin, in exchange of the new bicycle donated to him by Meghna Rodrigues. Thank you Meghna. This sum of Rs 1000 has been added to the kitty of funds we have received from various past recipients who willingly gave us a humble donation for the used bikes they have received from us. We will buy a new bicycle from the same for donation purpose someday soon, when the kitty amounts to a sum of Rs 4000 at least. Rakesh is from Lucknow, UP. He has been in Bombay, Mumbai, since he was a teenager. He studied until 8th standard as he could not study anymore due to lack of interest in formal education. Rakesh is married, but his first child to-be-born died during pregnancy when his wife got scared when she was in the toilet and someone …… ! She miscarried from the trauma and fear of that event. She could not bear a child thereafter. They have been to many doctors but are still unable to bear a child. He says that is the saddest thing about his life as its not God’s will maybe, he guesses. Another most challenging time he ever faced was when someone stole his bicycle and the clothes too that were tied to the carrier, when he went upstairs to a building apartment to deliver/take clothes. His clients, whose clotes were stolen, made him pay up for the loss of those clothes and subsequently over few weeks he paid off all his clients who demanded monetary compensation for the loss of their clothes they had entrusted him with, – the amount was almost Rs 25,000. That was the most difficult time he’s ever faced financially. As for daily challenges, it’s the autorickshaw fellows who drive very badly he says, he gets harassed by their indiscipline, he replied when I asked him if he’s ever suffered a road accident. Thanks to Anuraadha Tiwari for the donation of this new bicycle to ‘Rakesh Dhobi’, well, that’s how he’s addressed he says. 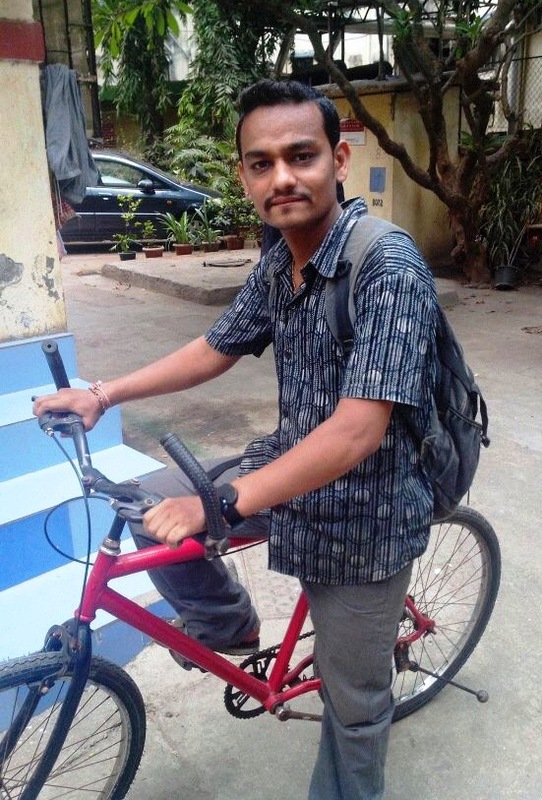 Rakesh has given us in exchange of this new cycle, his old cycle; his old bike is in good condition, and it will further be donated to a tea seller I casually happened to come across selling tea near Candies, on the corner of Bandra Catholic Gymkhana road. Thank you Siddharth Vora/Kohinoor Cycles for the good discount. Thank you Gazi Ali for the good service. 65th recipient – Tension mein cycle nahin chalane ka! I mention this because, in the past, a friend of mine offered me her bike for donation, but I found out it was in junk condition! I got upset that she did not have the courtesy, nor the dignity, nor the common sense to get her old bike serviced before offering it to us as her donation. After all, we are not ‘Kabadiwalas’ ya! (Kabadiwalas are people who profit from buying or receiving people’s junk!!!) And I said that to her to her face! :p Always think of the needy receiver’s self esteem and dignity. One thing I advised him, from the little I know from what I have read about our Brain’s behavior etc) on seeing him riding hearing music on his mobile headphones, “You have many things right about you, however, if you allow me to correct you, I can say to you, – Never hear music when riding a bicycle on the roads. Even if the volume is low! 64th recipient – I can put him on the bicycle and take him to a doctor or hospital. Bablu is educated till the 5th Std. He could not study any further because his family could not afford it. He has a family of two brothers and his father, they live in the village. His mother has passed away. His father travels on a bicycle from village to village selling firewood, vegetables, fruits, depending on the seasonal needs of the villagers. They have a house and some land in their village, but the cultivation they do on that land was and is not enough to feed their family. His own family living in Mumbai consists of two children and his wife. He hopes when their two sons, (3 years and 8 months), grow bigger, then his wife will do some work and earn a living too, because she is more educated than him and has learnt tailoring too. He wants to admit his elder son in school next year. Bablu does not have work all days of the month, as he is a daily wages worker, and gets paid only on days his contractor asks him to report to a work site, whether it’s to be an assistant (helper) to a carpenter or to a mason. The days he does not have work, he visits all kinds of construction sites to find any kind of ‘Helper’ work. Bablu said his most challenging period ever was last year when his elder son was unwell for nearly a year. He spent a lot of money on his medical care and he did not even have regular work in that period. I pondered on all what Bablu had said – He could not study, the land they own in the village could not feed them, he has still not found regular work, nor has he been able to achieve the purpose for which he came to Mumbai – to become a carpenter, and he has always lived an impoverished life since childhood; yet, it’s his child suffering (bad health for a year) that has superseded everything he has ever suffered before! I asked him about his happiest times ever; He replied, ‘Now, at this time I feel I am living in good times, because I am not jobless most days. Another reason why feel this is a good time for me is, earlier I was living in Colaba area and the room rent was Rs 3000 a month! Also, the cost of vegetables, and even the street food, is very high there. It’s only a few months ago that I shifted to Nalasopara, near Virar, where the rent is much lower than Colaba, and even the cost of vegetables and food is lower than Colaba. 63rd recipient – I have only heard of happiness. Never seen it. When I walk around Bandra early morning, I would often see a middle aged man on his bicycle, a bit over weight, riding at a slow pace with effort. He would stop en route his journey and sit down on one of the benches on the pavement by the sea side. To me he seemed to be contemplating on his past present or maybe future, he would always be seated quietly and I never saw him chat on his phone. I would wonder sometimes, what is going on in his mind when he comes and sits here on this bench in solitude en route his work. Though he wasn’t old, he always seemed fatigued to me and his shirt was always largely wet with sweat and marked with the pollution none of us can escape when we ride in our streets. One day I stopped to chat with him. And I explained to him what we do. He just could not believe what we were offering! He stood up and asked me to repeat the whole conversation again, about us offering him a new bike in exchange of his old one! As I repeated, he stared at me with wide open eyes. His name is Naimuddin, he sells Bread and Pau in Bandra. He is from UP. His family still lives in the village. His father, now no more, once owned his own bakery in Sion, and they were doing well. However, he died a premature death due to appendicitis many years ago when Naimuddin was very young. When his father died, Naimuddin’s elder brother took over their family bakery business, (literally took over completely!!!) and told his family they will have no share in the bakery thereafter, because their father has left the bakery in huge debt. So either the family should pay up their share of their father’s debt, or else just leave the bakery to him for good and he will pay the debts of the family, and if he does that then they cannot claim any share in its profits or its ownership thereafter. Basically, his elder brother ‘kicked’ them out of their rightful inheritance! When Naimuddin told me this, his eyes turned moist. He continued…. His mother told her eldest son to keep the bakery and they do not want any share in it. She instructed Naimuddin to travel to Mumbai and earn a livelihood for their family. Naimuddin had two brothers and one sister, his sister died a few years ago. Naimuddin’s eyes went moist when he spoke about the circumstances of his sister’s premature death. What he said about her death was too sad for me to share here with you people. After his elder brother betrayed their family, under the instructions of his mother Naimuddin arrived in Mumbai in 1980 and began working in a bakery. He worked as a baker for a few years, but then realized if he ferries bread and Pau on a bicycle from shop to shop he can earn some more money. He needed the extra money because his entire family was now dependent on him and his brother. Naimuddin made it in Mumbai by selling bread and Pau from shop to shop. Fortune favors the resilient and brave! He is married and back in the village he has his own family of 3 daughters and 3 sons. What is most commendable is that all his 6 children are educated!!! In spite of the fact that Naimuddin himself is just 4th Std fail! Most of his children are graduates or will soon be graduates, and the youngest two are in school! Ironically, his elder brother (who betrayed his family by taking over the family’s bakery and business) has not been able to achieve what Naimuddin has achieved even though Naimuddin had to begin his livelihood from zero. – Naimuddin’s elder brother’s children are not educated, most of them either dropped out of school mid way, or just never went to school! I asked him, ‘But are you not happy that you are receiving this new bicycle in exchange of your old one?’ And suddenly, Naimuddin’s face lit up like a million dollar note! He admitted he is very happy that he is receiving this new bicycle in exchange of his old one and no one in this world has ever given him such an offer before! Before he left, Naimuddin joined both his hands to shake my singular hand, both his hands nearly giving my singular hand a gentle hug. He was almost hesitant that I may not like it that he reached out to give my hand a hug. But he does not know his sense of immense gratitude touched me deeply! Thank You to Meghna Rodrigues for donating a new bicycle to Naimuddin; his old bicycle we will donate to some needy person. 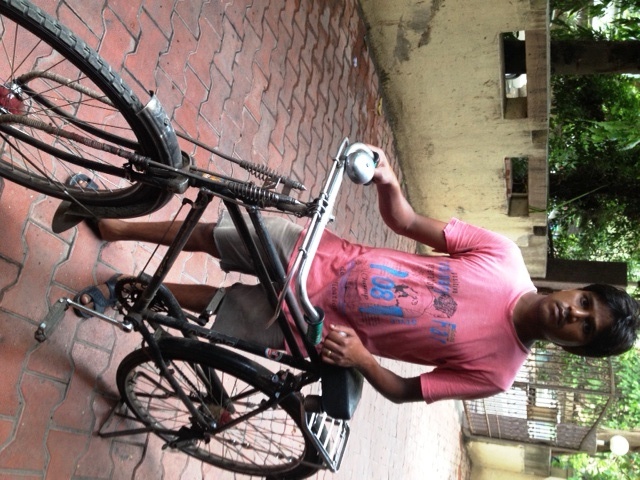 Naimuddin also contributed, in his own humble way, towards the purchase of this new bicycle that Meghna donated to him. And thank you to Kohinoor Cycles (http://kohinoorcyclestores.blogspot.com/) Siddharth Vora (https://www.facebook.com/siddharth.vora.58?fref=ts) for the good discount and service. And thank you to Gazi Ali for the pic. 62nd receipt of LB – Both we brothers felt ashamed and useless, bcus we could not find our own Mother! Vijay was born in a village near Pune, and was brought up in Mumbai also. His parents were vegetable sellers, they would sell veggies from house to house in Bandra’s Pali Hill area for many years. They still have a family house in their village near Pune, and they reside in Khar East. He has an older brother who works at an office in Munbai. Vijay has studied till the 8th Std. When he was in school, in the 8th, an earth-digging tool accidentally pierced his head from the back. He was critically injured. It happened when he was removing earth from the land and dumping it afar, as there was construction going on in the school compound, a new foundation was being laid for building a new building for their school. He received stitches and recovered, but somehow he could not study thereafter. It made me wonder, maybe that accident at school changed the course of Vijay’s life permanently! Maybe the head injury affected his attention span or whatever other damage it must have caused (I am not a doctor, so I am just guessing ya). But had he continued his studies he would have been more than a milkman and driver today for sure, I thought. After Vijay left his studies, he became a motor mechanic in Bandra, near Perry road. But he did not like that profession, and soon left it to sell vegetables like his parents. He would ferry them on a tube cycle. But that too did not suit his needs, as his father grew old and a bit unwell so they (his bro and he) needed to now look after their father. So he decided to deliver milk and also become a drive by day. He believed this combination would sustain him in the expensive metropolis of Mumbai. What I liked about him was, he told his father to retire from selling vegetables because his father was suffering from some medical condition because of which both his legs had got swollen and it was very difficult for him to walk and carry the heavy baskets of veggies house to house. Around 10 years ago he and his brother decided to become the breadwinners for their family, because they had grown up and would be able to provide for their father. Because, the commission he earns is so little that even if one milk packet gets damaged and rejected for no fault of his, he loses the commission equivalent to an entire tray of milk! God Bless those customers, I thought, who are willing to forgive these humble people their minor errors. Vijay’s saddest period ever was when his mother went missing for nearly 15 days. She left Mumbai to visit her village near Pune, but never reached there. While en route to her village, suddenly she decided to return to Mumbai and got off the the train, and crossed the platform to take the train going back to Mumbai. That’s when she was knocked down by the wind-thrust from a passing fast-train, while crossing from one platform to another. She fell to the ground and a rock or stone hit her head and she was grievously injured. Her family looked for her at every station between Mumbai and Pune. They even searched for her at Temples and relatives homes but found her only at a hospital between Badlapur and Kalyan in a critical condition!. She succumbed to her injuries. 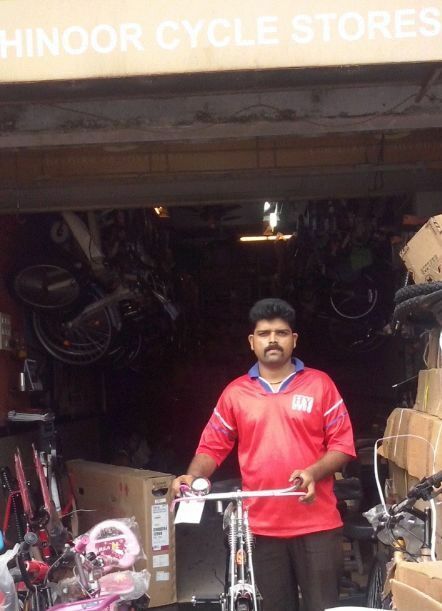 Thank you to Ashish Sajnani for buying Vijay a new bicycle. Vijay agreed to bear a minor part of the cost of the bike as his own contribution to this donation by Ashish, the exchange of his old bike for a new one. 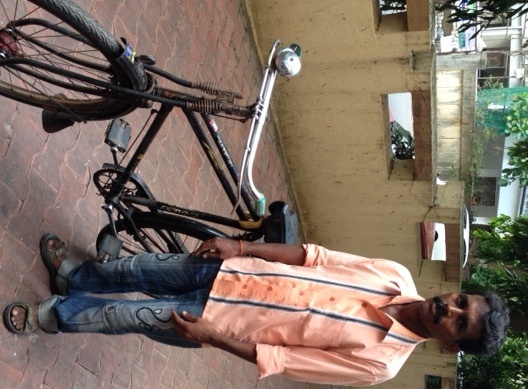 Vijay’s old bicycle we will donate to some needy person who needs one for his livelihood. I have in mind to donate it to a Samosa seller I happened to come across near Almeida park one day. And thank you to Kohinoor Cycles (http://kohinoorcyclestores.blogspot.com/) Siddharth Vora (https://www.facebook.com/siddharth.vora.58?fref=ts) for the good discount and service. Thanks to Gazi Ali for the pic.